An indispensable guide for all those new to the sport of eventing, Eventing Explained is a unique, all round view of how to start eventing. 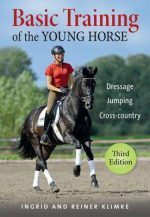 For riders of all ages wanting to compete in their first affiliated Horse Trials, this book is packed with top tips and exercises for riders in all three phases. With sections on rider fitness, sport psychology, horse fitness, training for dressage/show jumping/cross country, preparation, who’s who at events, competing and more, this is the ideal aid to help you prepare for the event and do the best on the day. Liza Randall combines her two loves as an equestrian writer and Pilates coach from her case in the Cotswolds. Author of Pilates for Equestrians and former editor of British Eventing Life magazine, she has a passion for eventing, whether watching or competing. Liza is an advocate of classes being available to riders of all abilities, and worked with British Eventing when the BE80 Training series was launched. As an equestrian Pilates coach, Liza trains amateur and professional riders alike, teaching the recruitment of core muscles to develop balance, strength and coordination.